How many drag race their Bandits? Their needs to be a dragstrip section on here. I'm not worried about going through the twisties or packing some luggage for traveling. I'm 39 years old and I like putting the hurt to all these young punks I have around here who ride around on their stock little crotch rockets. They have an attitude bigger than their bike! 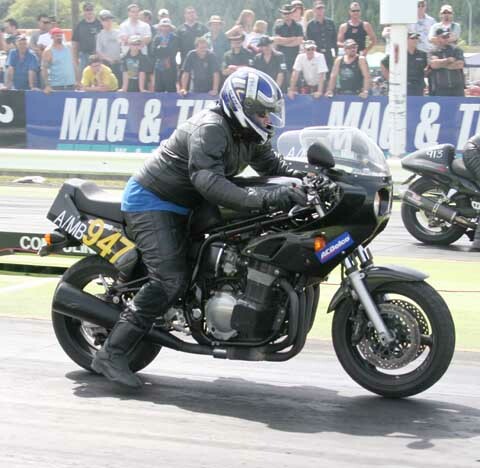 I've been drag racing bikes for 30 years (started with a Yamaha 80cc!) I've had a CBX, GS 1100e, V-Max, FJ 1100, XS 1100, Kaw 750 triple, and a ZX 1100!! All of them came and went but for some reason I"m really attached to my Bandit. Central Illinois huh, does that mean you hang out at Cordova? Land_shark and I head up to Earlville, Iowa to the 1/4 mile there once in a while. Although we havn't run our bikes yet. I see quite a few other bandit or bandit engines up there. A friend of mine has a pro stock gsxr with one of your gs 1100 engines in it. From what I've heard they can be punched out to ~1500cc. I had never been to a drag strip before this summer, but he got me interested in hanging out at Earlville's strip, and for over a month straight I was there every weekend! Here is a pic of his bike. Anyway, if you are ever up there, send us a message! It's fun just to hang out at the strip, ya know! I'm 58 years old, and have been dragracing for a long time. I am now thinking about running the Texas Mile, on the 22nd and 23rd of this month. It should be fun. Re: How many drag race their Bandits? Their needs to be a dragstrip section on here. Send a P/M to one of the admins and I'll bet they set one up for ya!! I think it's a great idea... wouldn't mind having all the drag info in one place. How about a sticky thread for drag racers right here in the performance section? If it get's too busy/big we can think about a separate drag racing section. A friend of mine has a pro stock gsxr with one of your gs 1100 engines in it. From what I've heard they can be punched out to ~1500cc. The Bandit motor can see that kind of displacement, too with a stroker crank - which the GS motors need to go that big, too. I'm not an expert on drag racing, but from what I've gleaned from reading Pro-Stock rules don't allow 4-valve motors that much displacement, which is why they use the old GS 2-valve motors. Pro-Street does allow 1500cc Bandits, but they can't run wheelie bars and run on DOT tires. Now thats what I'm talking about! I'd like to put a 1216 kit in from JE Pistons with the 13:1 compression. I know, I know, I would have to run race fuel! I'm prepared to do so. I don't really go on that long of trips anyway to worry about using alot of fuel. I bet with that kind of compression the Bandit sounds sweet running through an open V&H pro pipe. Interested to hear what sort of numbers you guys are running at the strip on your Bandits. Bike specs and rider weights would be helpful. Here is my post from earlier this year. Just thought I would show off and let you guys know what happened at the NZ Drag Nationals in the weekend. I won the DYO Street bike class on my GS1200SS..So I'm the new Street Bike National champion." Here is a pic of the Trophy. Since then I learned that my GS1200SS is SPEED limited to 180kph.That explains the 114mph top speed.It was just hitting the limiter at the top end. Still it helped my consistency which never hurts in DYO racing. I hate to say it, but I always did like those bikes. Luckily a buddy of mine is a big kaw fan and heated rivalry between us keep me from buying one. Pretty close at the drag strip too. bstard, on the win. Keep up the good work. Sorry to throw this thread on another tangent, but did anyone see that SpeedTv's Pinks episode with the suzuki 1100e vs VRod. I was glad to see the Suzuki won even after giving the Harley time to cool down, and a bike length lead. Oh ya, it was a third of the cost too! Sorry to throw this thread on another tangent, but did anyone see that SpeedTv's Pinks episode with the suzuki 1100e vs VRod. Speed \TV is going to be at the Texas Mile this month for some 1 mile speed compitition for pinks.